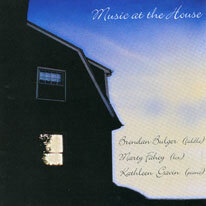 Boston-born Brendan Bulger, Chicago's Marty Fahey, and Kathleen Gavin, with the help of Dennis Cahill as their producer and sound engineer, have released a excellent new album with a decidedly old-fashioned sound, down to the vamping piano accompaniment which sometimes starts the tracks with the ceili-style "two ticks." Even the artwork reinforces that impression, with the CD itself being made to look like an old microgroove long-playing record. In fact, the first time I heard the CD, it immediately reminded me of the "Kiss Me Kate" LP recorded by Liz Carroll and accordion player Tommy Maguire back in the 1970s. As it turns out, Fahey plays here the very same instrument which Maguire had used back then. But one might as well draw a comparison with the great Burke-McGann-Dolan recordings of that same period. This is no accident, says Fahey, but rather the result of a deliberate choice on the part of the musicians to play with what he describes as a "hands-off" approach to the tunes, so that the melodies may speak for themselves, as it where. No matter what the philosophies behind the playing may be, it is the players' high level of musicianship, allowing them to express their vision in sound, which makes this such a successful recording. Another contributing factor has to be the great choice of material, with a unique Chicago flavor thanks to the unusual settings of tunes learned from Johnny McGreevy and Jim and Eleanor Neary, among others. This is a thoroughly enjoyable recording, and while, as Fahey also points out, listeners will ultimately decide for themselves, the trio makes with it a powerful case for that old-fashioned approach to music making.